Married Name Her married name was Suzanne Bush. Fay Jean Parsons was the daughter of John Parsons. 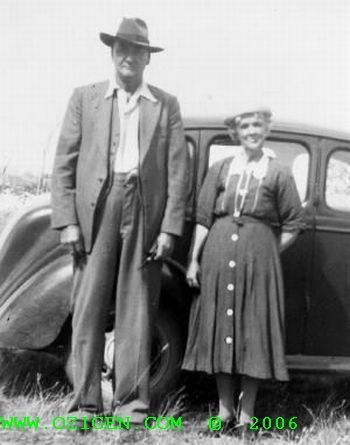 Marriage Fay Jean was married to Rex Cramp. Married Name Her married name was Fay Jean Cramp. Marriage Rex was married to Fay Jean Parsons, daughter of John Parsons. Death 9 August 1961 Marjorie Bush died on Wednesday, 9 August 1961 at Gunning, NSWG, at age 82. Name Variation Marjorie Bush was also known as Margaret. Married Name 1910 As of 18 May 1910, her married name was Wales. [S2] Index of BDM records, NSW BDM, Place of Registration: Gunning; Year: 1878; Number: 25131. He was the son of John Bush and Hephziba Bush. [S2] Index of BDM records, NSW BDM, Parish of Registration: C of E Gunning; Year: 1951; Number: V18511964 38A. [S2] Index of BDM records, NSW BDM, Place of Registration: Yass; Year: 1873; Number: 4303. [S2] Index of BDM records, NSW BDM, Place of Registration: Gunning; Year: 1938; Number: 588. Birth 1 December 1853 Ann Alchin was born on Thursday, 1 December 1853 at Argyle, Gunning, NSW, AustraliaG. She was the daughter of Ambrose Alchin and Elizabeth Ann Roughan. Death 6 October 1933 Ann Alchin died on Friday, 6 October 1933 at Jerrawa, NSW, AustraliaG, at age 79. Married Name 1873 As of 1873, her married name was Bush. Death 13 August 1991 Laurel Arthur Wales died on Tuesday, 13 August 1991 at Roman Catholic cemetery, Boorowa, NSW, AustraliaG, at age 83. Burial He was buried at the Church of England Cemetery, Boorowa, NSW, AustraliaG. Jack Wales, a former shearer and long time union member, tallies up a special golden fifty on April 10 when he celebrates his fiftieth wedding anniversary. Fifty years ago in the tiny stone Anglican church at Bevandale near Gunning, NSW Laural Wales, shearer, better known to his family and friends as Jack, married the daughter of a well known family in the district, Miss Sylvia Gorham. When the marriage pledges were made and the "I do's" completed the couple with their small gathering of family and friends went back to Jack's fathers' nearby property, "Killarney" for the traditional reception. "Killarney" has long since gone but not so the memories. And one special memory Jack and Sylvia have is of their wedding cake. Its centrepiece was a basket. Sylvia has kept it throughout the fifty years of her marriage, stored safely in an airtight glass jar. Now, on the couples' golden anniversary, it will again take pride of place in the centre of her wedding anniversary cake. Fifty years of marriage brought Jack and Svlvia eight children - Dawn (Mrs Barton), George, John (Snow), Ron (deceased), Kevin, Leon, Graham and Raymond plus 15 grandchildren and three great grandchildren. They plan a big luncheon party in the Boorowa Ex Servicemen's Club and expect over 70 family and friends will join in the celebration. Jack and Sylvia enjoy relatively good health for their age. Now almost 79, Jack is an avid card player and Sylvia who turns 70 in August still takes up her knitting needle and handicrafts in spite of her now failing eyesight. Over the years Jack has become a collector of union tickets. His own membership tickets cover a continuous membership period of over fifty years and another dated 1905-06 was given to him by the late Bill Bush. That ticket cost its original owner ten shillings! Jack's shearing days in the 30's and 40's brought him in contact with many a colourful character and he can relate with glee some of the sagas associated with the days of Ted Healy, of union politics and union meetings where members arrived by bus loads to support their chosen candidate. As a local union representative Jack went to all the union meetings and conferences and he will talk at length about personalities such as "Pump-handle" Owens who cycled his bike round the west shaking hands with everyone he met as he went about the business of signing up members. The AWU Jack says is a good clean union and he'll vouch for the fact that it does a lot to help its members. The Union helped him sort out a compensation claim after he was injured at work many years ago. Jack was only 14 when he first joined the AWU in 1922. In those days he was only a rouseabout at "Coree" at Jerilderie but five years later he was a fully fledged shearer and well and truly settled into his new trade. During his shearing days he shore throughout the outback and southern Queensland but Boorowa was always home base. He has lived in the district for 49 years and moved into town about twenty years ago after he sold his small property. But this year it will be the year 1937 that will be most in Jack's mind . . . that day fifty years ago when Jack the shearer married Sylvia in the little stone church at Bevandale. Happy Anniversary Jack and Sylvia. I am Sylvia Wales, née Gorham. I was born on 10th August 1917 at my mother's home, "Ivanhoe", at Kennys Creek, Rye Park, NSW. I had two sisters and three brothers. We all walked two miles to attend Kennys Creek school. We only ever had one teacher and she taught all classes, 1st to 6th class. I left school when I was about 14½ years old. I stayed at home for awhile, then, in 1935, I got a job at the Boorowa District Hospital working as a housemaid and cooks help; my wage was 10 shillings ($1) per week plus board. In 1935 I also met Jack Wales; his grandfather was Michael Wales and his father was Gilbert. In early 1937 we were married in the Church of England Church at Bevendale; our daughter, Dawn, was born that same year. In the next twenty years we had seven more kids, all boys, so my time was taken up cooking, washing, knitting, sewing and cleaning up after all the kids. Times were tough, but Jack was a shearer and got plenty of work. In 1937 - 1939 the shearing rate was £1.9.3 ($2.93) per one hundred sheep and they worked till noon on Saturdays. In the summer of 1938 (February - March) Jack got a job scrubbing (digging seedlings and ringbarking trees) at Biala, a small settlement near Crookwell. We bought a twelve foot square, two room tent and set up camp on the site; Jack, myself and our little girl, Dawn. We were camped near a dam in the fork of two gullies. Around 2pm one afternoon a storm came up and a cloudburst hit the area. Jack came racing back to camp, calling out to me to put things up on the tables. The flood was coming down both gullies. Jack tightened up the tent ropes and lifted the sides up and the water ran straight through the tent with us three sitting on the bed. The water was only about one foot deep so we didn't get our bed wet but it put out the fire. The storm lasted only a short time and, though it was no joke at the time, we have had a few laughs about it since. 1939 came and war broke out. Jack's brother, Bill, and one of my brothers were in the army but, luckily, they both returned. We were now living in a rented house in Boorowa but, in early 1940, we had the offer from one of my uncles to buy his property, so we bought the place, 700 - 800 acres at Gunnary with a fair house on it. So we shifted out to the farm, which was called "Carinya", on Saturday 14th April 1940. In July 1942 Jack was shearing in the Hay District of NSW when a sheep kicked him on the right leg, just above the knee. It turned into an abscess and he was brought home to the Sacred Heart Hospita at Young. On 21st July 1942 he had two operations at Young and then was taken to Sydney. On 19th October 1942 he had a further operation on the leg at Sydney and the leg was put in plaster. He came home two weeks before Christmas and was on crutches for nearly three months. It finally healed and he was able to work again. The Australian Workers Union stood by us and arranged compensation payments for 7 to 8 months. Our daughter Dawn soon reached school age and we arranged a correspondence course for her for awhile. However, the boys were soon also of school age and as there were a number of other children in the same area as us, the parents got together and got enough names to have a bus run to Boorowa Central School. The bus started the run on 21st April 1947. Life went on as usual, day by day and not very exciting when one lives in the bush. However, on 17th March 1952 the power line came through to our area and was connected to our home and the woolshed. What a wonderful thing! No more kerosene lamps (beautiful lights). I still cooked on a fuel stove and we still had a nice big open fire. We bought an electric washing machine, iron and jug and installed an electric shearing machine and, Oh Boy!, we bought an electric blanket that was heaven to have a nice warm bed to get into. Our next big setback was with Ron, our fourth child. He was about twelve years old and got an abscess on his leg. He was put in Boorowa Hospital on 6th September 1956 and was taken to Sydney on 12th September. He was back and forwards between Boorowa and Sydney till 21st March 1957. He never really recovered and he walked with a limp thereafter. He married Kathleen Horne and was very happy. He was working for the Boorowa Shire and was involved in an accident and killed on 10th September 1968, aged 24 years. Ron and Kath had a daughter who was born on 6th April 1969. In 1966 we sold our farm and bought a home in town. We finally left the farm on 26th January 1967. We had only the two youngest boys living with us then; the rest were married and gone their own way. I am still living in the same house we bought in December 1966; we paid $8,400 for it. From 1968 there was nothing much to speak of. Life just went on day after day. Jack and I and some friends had a few trips to the Interdominion Trotting. 20th February 1974: We left Boorowa by bus to Adelaide then by plane to Perth where we had a lovely time. We arrived back on 25th February. 10th February 1975: We went by bus to Sydney then by plane to Wellington in New Zealand. We toured all over the North Island and saw a lot of interesting things. We arrived home on 18th February after a good trip. 10th March 1975: We drove our own car to Moroya and were flooded out of the caravan park on the first night there. We drove out of the park at 2.30am on 11th March and finally back home on 13th March. What a trip, and the second experience in flood waters. 24th October 1975: We went by bus to Melbourne and then by boat to Tasmania where we toured over most of Tassie by bus. Then back to Melbourne and home by bus to arrive on 1st November. 13th February 1976: We went by bus to Adelaide and went to the Trots. Drove around and saw the sights and were home by 23rd February. 10th April 1976: We were woken by the police at 4am to let us know that our 18 year old son, Raymond (our baby), had been in a car accident and been taken to Canberra Hospital and then on to Sydney. He came home on 3rd September 1976, having recovered from the accident but he was confined to a wheelchair. He worked in Canberra for a few years and then went to Adelaide for a few more years. He used to come home 2 or 3 times a year. On 20th July 1984 my husband, Jack, became ill with heart troubles and was in and out of the Boorowa and Canberra Hospitals from then on until he passed away at 9.40am on 13th August 1991 at the age of 83. He was buried in the Boorowa cemetery on 15th August 1991. Now back to my son Ray who on 26th September 1994 was working in his flat in Adelaide when there was an explosion and he was thrown from his chair unconscious. The police were called and they took him to the Royal Adelaide Hospital where he passed away at 5am on 27th September 1994, aged 37. We arranged for him to be brought back to Boorowa where he is buried beside his father in the Boorowa cemetery. Our married life wasn't all roses and we never had much money and only ever had old motor cars. We made do with what we had and enjoyed our life together; it was a lot of fun. There were a few setbacks and family hurts, but I think that's what keeps a family together. We were married for 54 years and as at 13th December 1997 I have 15 grandchildren and 17 great grandchildren. To date there are only two great grandchildren with the Wales surname - Jack William and Melissa Wales, the children of Robert and Sandra Wales. [S2] Index of BDM records, NSW BDM, Place of Birth Registration: Gunning; Year: 1908; Number: 25041. [S2] Index of BDM records, NSW BDM, Place of Marriage Registration: Yass; Year of Registration: 1937; Registration Number: 6978. [S357] Electoral Office Commonwealth Of Australia, Electoral Roll, Subdivision: Boorowa; Page: 30; Number: 1743. Marriage 21 April 1943 Sarah Joyce was married to Gordon Clifford Carroll, son of Thomas Victor Carroll and Mable Ann Noakes, on Wednesday, 21 April 1943 at Gunning, NSW, AustraliaG. Married Name 1943 As of 21 April 1943, her married name was Carroll.